To say the building has a storied past would be an understatement. Most notably, in 1667, Vilnius Castellan, Hetman of the Grand Duchy of Lithuania, Mykolas Kazimieras Pacas, (of the influential Pacai family) bought two adjacent buildings and turned them into one of the most ornate mansions in Vilnius. The palace was designed and decorated by the same Italian architects, painters, and sculptors that worked on the Church of St. Peter and St. Paul in Antakalnis, Vilnius, and Pažaislis Monastery in Kaunas—considered to be masterpieces of Lithuanian Baroque. 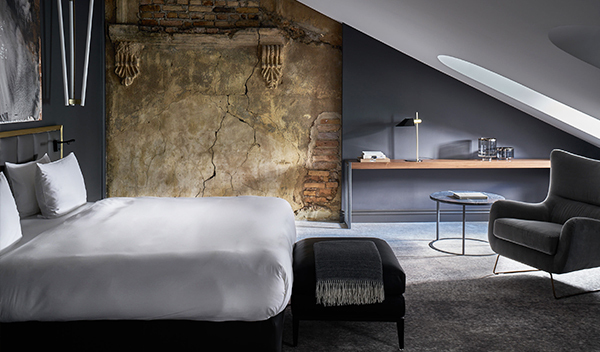 Creating a hospitality experience attuned to cultural authenticity and rooted in the charismatic city meant the approach to re-invention was equal parts transformation and preservation. Architect Saulius Mikštas strived to preserve as many authentic architectural details as possible, including the courtyard and arches, as well as the original frescoes found throughout the inside of the building. Unearthed wall paintings were restored fragment-by-fragment, and many layers of wall paint were removed to reveal the most interesting and well-preserved layers, mostly from the Baroque period when the palace belonged to the Pacai family. In the process of restoration, many doors that were closed and cemented after the palace was taken over from the family were opened again. Details like the enigmatic staircase, authentic statues, and an abundance of historical artifacts have been lovingly incorporated into the new incarnation and two more floors were added, resulting in a five-story hotel with a reconstructed Baroque rooftop. It was an incredibly exciting moment when we saw the history first-hand. It was a time capsule of our country, and we felt the life lived during the epoch of the Grand Duchy of Lithuania. We saw the same paintings and art pieces that Napoleon, Tsar Alexander I, Polish king John Sobieski and other historical influencers saw. Central to the hotel’s cultural ethos, an expansive courtyard is flanked by the hotel, which evokes the Old World atmosphere of the city. The open-air space is the social heart of the hotel, where guests enjoy art events and dinners that stretch long into the night. 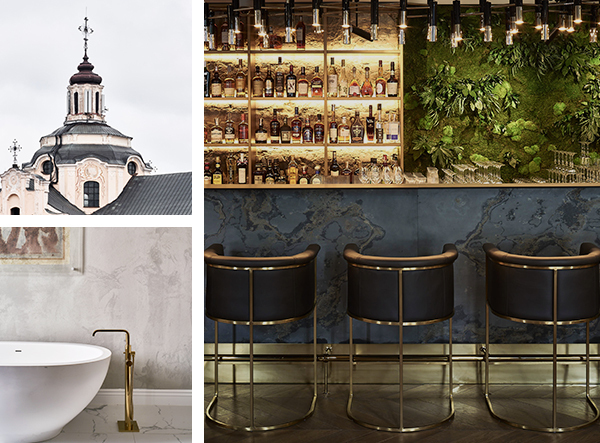 Here, a remarkable hospitality experience is a fitting reflection of the merged eras of this singular destination—one where the narrow, winding roads of the Old Town sit alongside gleaming skyscrapers, urban drinking dens, Soviet relics, royal palaces, and steepled churches. 94 rooms and 10 suites are each a study in spaces crafted uniquely around their own distinct set of features. From intricate wall detailing, like painted faux columns and rugged exposed brick, to original wooden beamed ceilings and frescoes, all have been lovingly revealed and highlighted. Subtle room palettes range from eggshell and light grey, to taupe and deeper browns, ample mind paid to ensure the room’s natural characteristics dictate the design. Public spaces feature dark greys and blues, with the flooring and stairs receiving a treatment by Pandomo Loft. Rounding out the hotel’s world-class offerings, two New Baltic dining concepts have been conceived by the JSC “Nordic Food Republic”, where the Claus Meyer, co-founder of the much-lauded Noma restaurant in Copenhagen, is one of the investors. The 40-seat brasserie 14 HORSES is open for breakfast, lunch, and dinner, with a finely crafted seasonal menu inspired by Baltic heritage and New Nordic cuisine. The more casual 40-seat SOFIJA Bar is ideal for cocktails and smaller plates and takes inspiration from Baltic street food. Both buzzing venues extend into the central courtyard for al fresco consumption. Other services on site include a full-service spa, gym, two conference spaces that can be adapted to various needs, and a shop showcasing the region’s storied amber stone, and high-end watches.